February 2019 Paper of the Month. NASA is exploring rotorcraft designs for VTOL air taxi operations, also known as urban air mobility (UAM) or on-demand mobility (ODM) applications. Several concept vehicles have been developed, intended to focus and guide NASA research activities in support of aircraft development for this emerging market. 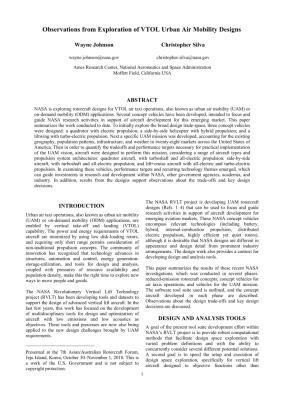 This paper summarizes the work conducted to date. To initially explore the broad design trade-space, three concept vehicles were designed: a quadrotor with electric propulsion; a side-by-side helicopter with hybrid propulsion; and a tiltwing with turbo-electric propulsion. Next a specific UAM mission was developed, accounting for the existing geography, population patterns, infrastructure, and weather in twenty-eight markets across the United States of America. Then in order to quantify the tradeoffs and performance targets necessary for practical implementation of the UAM vision, aircraft were designed to perform this mission, considering a range of aircraft types and propulsion system architectures: quadrotor aircraft, with turboshaft and all-electric propulsion; side-by-side aircraft, with turboshaft and all-electric propulsion; and lift+cruise aircraft with all-electric and turbo-electric propulsion. In examining these vehicles, performance targets and recurring technology themes emerged, which can guide investments in research and development within NASA, other government agencies, academia, and industry. In addition, results from the designs support observations about the trade-offs and key design decisions.